You are changing your site to a responsive layout and all existing content should self-adjusts according to the browser window size. 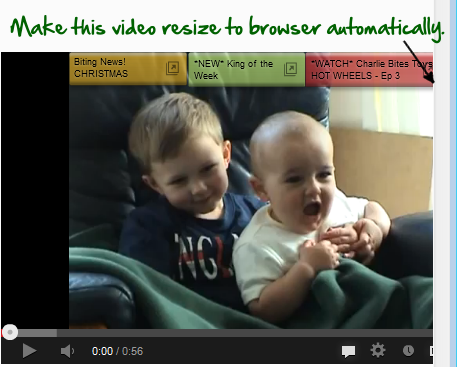 You are creating a new site and want all new embedded videos to be auto-resizing. You need to find and change all your existing video embeds and change the code. For new videos, you need to remember to insert them in the new format. The "56.25%" is actually the aspect ratio of the video. Although most newer videos fall in this category, others would not display properly. Making Youtube Videos Responsive Without Changing Code. Will adding Jquery decrease my site performance? Well, not really. The minified and zipped Jquery file only has a total size of around 31Kb. Also since Jquery is loaded from Google directly, chances of the visitor's browser already having Jquery in it's cache via some other site is very high. In short, Jquery is really light and would not need to be loaded again for your pages most of the time and the performance impact is near zero. Now you need to load the actual code which makes the embedded videos auto-resizing. There are two ways to do this. As you can see, the iframe gets wrapped insided a <div> element with a bottom padding equal to the exact aspect ratio of the video calculated by the script. The video will show in the original size initially and if the browser width is reduced,it will resize itself accordingly. You can check out this demo page showing the script in action. Also See: How to backup your entire YouTube video channel to Google Drive. Thanks for posting this! Your solution is time/life saving. The code doesnt work for some reason anyore. If i remove the "if" tage for the match then it works. The match code has to be fixed I believe! I dont know if there's a better regex expression match code but this works for me! Thanks though for the rest! Thanks a lot for noticing Richie. Have corrected the code. The issue was that Youtube changed the iframe source from https://youtube.com/embed to //youtube.com/embed. This worked great thanks! I originally had my pages resizing but my videos wouldn't until now. Thank you very much! This is an awesome help. Thank you very much! Last 2 days i have find solution this problem, but i can not find any solution any other site......just now i have relax... thank you so much for share very useful article. In what part of the page header will I add this code?